On a recent visit to the Kimbell Art Museum with my four year old, this painting featuring monsters was a highlight. We talked about which monsters were the scariest and how monsters have looked differently in the past. Although Cezanne’s Man in a Blue Smock was my favorite, my favorite experience was looking at the monsters in this painting with my son. Marilyn Monroe is one of the perks of studying history. When you combine a, um… well, purely academic interest in Marilyn with the recent Marilyn Monroe film and the article in Vanity Fair – it all adds up to make her a front burner figure. I was stopped in my tracks when I encountered 25 Colored Marilyns at the Fort Worth Museum of Modern Art. The silk screen imperfections made me reflect on which one is the real Marilyn? We know that Marilyn was a brand and that the real person was complicated and wasn’t always beautiful – like all of us. If you look at the bottom of the painting you will see some scuff marks. When I took the monthly architectural tour, the docent told the story of how the painting was purchased for $100 and placed in front of a sliding glass door. Whenever the owner wanted to open the door, the painting had to be moved – that’s where the scuff marks came from. From far away the brick wall on the left and the end of the street pull you in. The woman’s eye become visible only after you lean in. The woman is looking at you; you are a part of the conversation. The bricks, the end of street, everything about the setting disintegrates into brushstrokes. The only thing in focus is her face. Brillant. 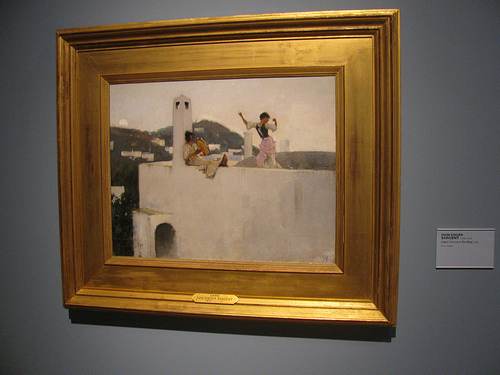 A Street in Venice by John Singer Sargent is on view at the Amon Carter Museum until June 17. This Pocket-Art (at the Bruno David Gallery STL) was made out of all kinds of different materials and included all kinds of different themes. For about $100 you could carry these business card sized art-works around in your wallet. What is the deal with the Mona Lisa? That drab olive background, the flat black clothes, and she is awfully ordinary. I remember when I first saw La Jooconde as she is known in France, I was really trying hard not to be disappointed. As I was jockeying among the mass of tourists, I was sure it had to be me that was just missing something. Finally after spotting a group of British students talking amongst themselves, I asked what I was missing, what I should be looking for. 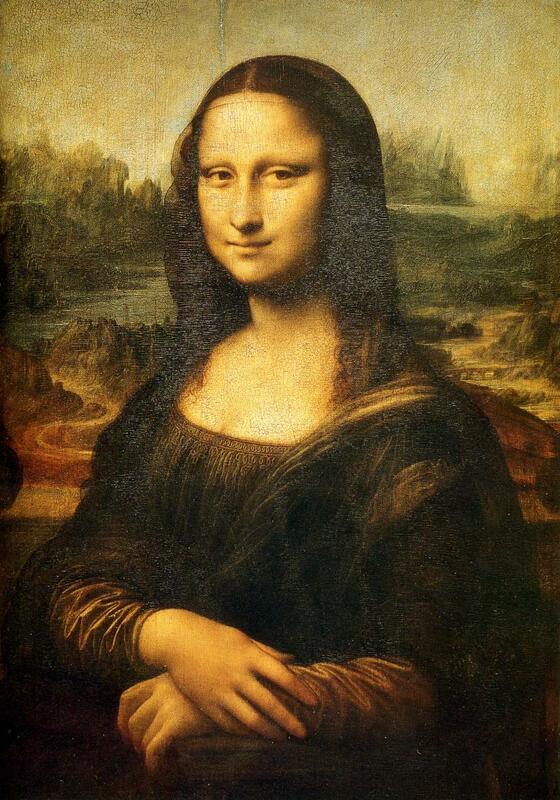 One of them explained that if you walked around the Mona Lisa there was a point at which that perplexing expression became a smile. I will never forget the moment I saw that for myself. Through the bulletproof glass, across a room full of tourists from all over the world, the Mona Lisa and I shared a moment. This is the Rothko at the St. Louis Art Museum. I love that it is displayed so it can be viewed from all the way across the museum. It starts out as a distant beacon… Then there is that magical Rothko moment when the dark, dull paint starts to become visible up close through those rudely bright colors. When I let go, I feel like just as I am reaching out to the painting, it crashes down on me like some deeply mysterious surf. I walk away, not sure if I’ve experienced it or not. The press tour from Reflections of the Buddha at the Pulitzer Foundation for the Arts. The Buddha’s head is elevated so that the viewer can make eye contact with the statue. There is so much going on in this painting, but you always come back to the barmaid’s sad, resigned expression. A Barmaid at the Folies Bergere was in my dorm room in college. The original in London wasn’t the momentous experience I thought it would be. This was a really special homework assignment. My grandpa had a movie theater in his basement. After he died, I got the collage that hung above the basement door. Seeing Hedy Lamar and Cary Grant while descending the cold steps are, for me, as old as time itself. Admission was always a dime, no exceptions. Click on the image to enlarge it.